When the first track on this "hard rock" album begins with saxophone solos and with heavy hammond organ and no singing at all, do I start to face despair and wonder if I got the wrong album? 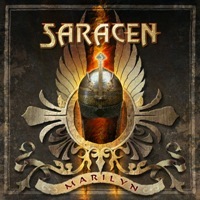 But this is the band Saracen and they have made a concept album with tracks about the life and the time of the ultimate Hollywood icon Marilyn Monroe's problematic life and her untimely death. In the 3rd track, the Norweigan singer Issa takes care of the microphone and lifts the ballad to a powerfull and strong track and in the following song does the wonderfull American vocalist Robin Beck a contribution with energy, sense and depth. In "Who Am I" Robin does a nice and groovy rock song with the English vocalist giant Steve Overland (FM & Overland). "Love Like a Razorblade" is a 70s song with Steve Bettney at the microphone and it contains some nice guitar solos. "Break the Spell" is a more of a modern rock song, but I miss Robin on the vocals in this one. "Unfinished Life" is the only track that I would call Hard Rock, because sad to say but, all the other songs is Rock or Symphonic Rock and therefore it's hard for me to give a high raiting for "Marilyn". Best songs: "Marilyn", "Hold On", "Who Am I" and "Unfinished Life".